September 1: As the NKA “noose” tightened on the Pusan Perimeter, Fifth Air Force units conducted relentless CAS and interdiction missions against NKA troops and armored columns attacking along the Naktong River front. Carrier-based aircraft from USN Task Force 77 also provided close air support to the perimeter defenders. General MacArthur directed General Stratemeyer to use all available FEAF airpower, including B-29s, to help the Eighth Army hold the “Pusan Perimeter,” the southeast corner of the Korean peninsula that South Korea still controlled. September 3: Task Force 77 withdrew its aircraft carriers from the Pusan area. It needed to conduct replenishment at sea operations and to move TF units north to strike communications targets. All close air support responsibility now rested with Far East Air Forces. September 4: An H-5 helicopter rescued a downed U.S. pilot from behind enemy lines at Hanggan-dong. It was the first H-5 helicopter rescue of the war. September 6: As North Korean forces approached Taegu, Eighth Army headquarters withdrew to Pusan. September 8: The 18th FBG, which had departed Korea a month earlier, returned from Japan, settling at Pusan East (Tongnae). The 6002nd Fighter Wing moved to K-9 (Pusan). September 9: North Korean forces attacking southeast of Hajang reached a point only eight miles from Taegu, their farthest penetration on the western front. FEAF Bomber Command began a rail interdiction campaign north of Seoul to slow enemy reinforcements, which might hinder the UN Inchon landing. Inchon Landings. Four LST’s unload men and equipment on the beach at Inchon, Korea on September 15, 1950. Ships include: LST-611, LST-745 and LST-715. September 13: Typhoon Kezia hit southern Japan, hampering FEAF operations and forcing some aircraft to move temporarily to Pusan and Taegu. September 16: U.S. forces secured Inchon and began moving toward Seoul. From the vicinity of Taegu, the U.S. Eighth Army launched its long-awaited offensive. September 17: U.S. Marines captured Kimpo Airfield near Seoul. 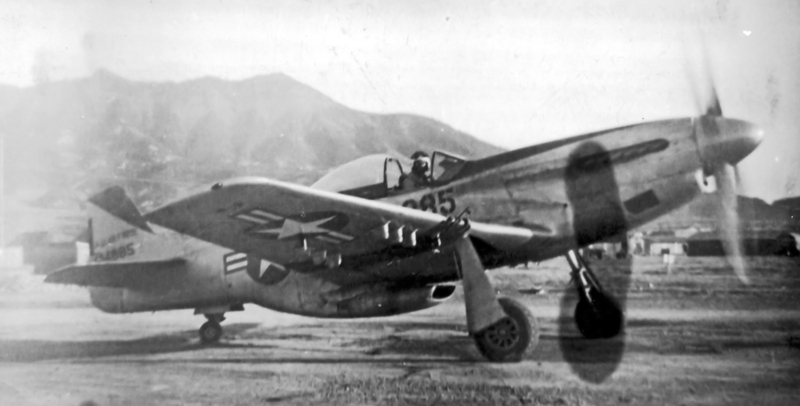 To support the Eighth Army offensive, Fifth Air Force F-51s and F-80s flew napalm attacks, reportedly killing over 1,200 enemy soldiers in Tabu-dong, Yongchon, and other strongholds near the Naktong River. September 19: Supported by Fifth Air Force close air support missions, the 24th Infantry Division began crossing the Naktong River near Waegwan, and the 1st Cavalry Division broke through communist lines. September 21: USAF forward air controllers in T-6 Mosquitoes equipped with air to ground radios spotted about thirty enemy tanks preparing to ambush the advancing 24th Infantry Division. They called USAF aircraft and USA ground artillery, which destroyed fourteen enemy tanks and forced the rest to flee. 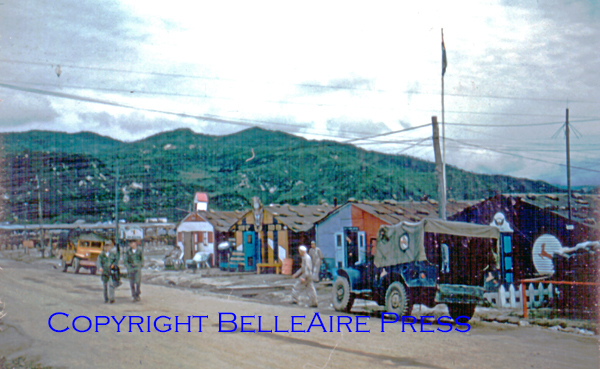 September 23: HQ Fifth Air Force in Korea moved from Pusan to Taegu. September 25: Far East Air Forces flew flare missions over Seoul all night that allowed USMC night fighters to attack North Korean troops fleeing the city. September 26: U.S. military forces from Inchon and Pusan linked up near Osan, while ROK troops with Fifth Air Force support moved northward along the east coast toward the 38th Parallel. September 27: U.S. Marines drove enemy forces from Seoul and took control of the capital building. The Joint Chiefs of Staff ordered General MacArthur to destroy the North Korean Army, which involved crossing the 38th Parallel into North Korea. Only ROK troops were to be allowed by the UN Command in provinces bordering China and the Soviet Union. September 28: ROK troops advanced into North Korea for the first time and General MacArthur officially restored Seoul to ROK President Syngman Rhee. 1 U.S. Air Force Historical Research Agency. January 2002. The U.S. Air Force’s First War: Korea 1950-1953 Significant Events. September 1950. 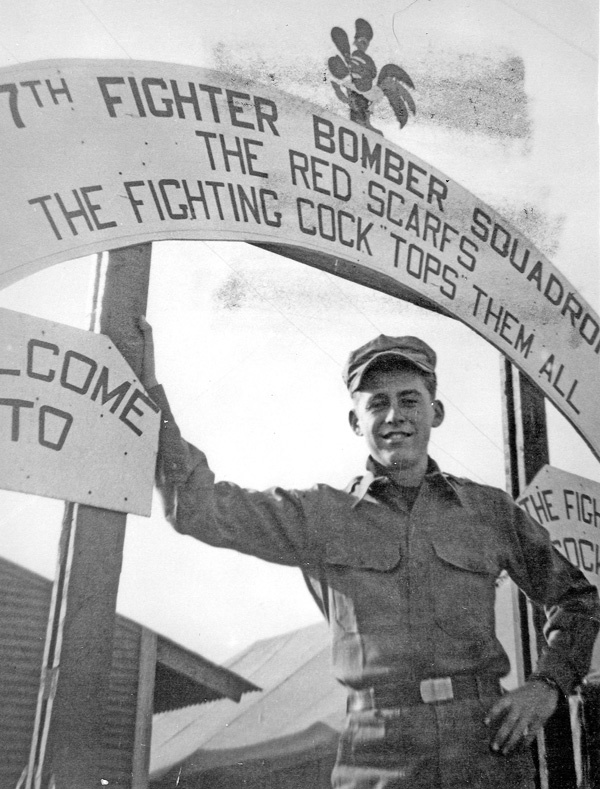 2 History of the 18th Fighter-Bomber Group, July-October, 1950. USAFHRA. 3 History of the 18th Fighter-Bomber Group, July-October, 1950. USAFHRA. 4 History of the 18th Fighter-Bomber Group, July-October, 1950. USAFHRA. 5 USAFHRA. 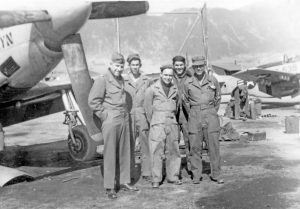 “The Story of the 18th Fighter-Bomber Group in the Korean United Nations Police Action.” 6002nd Tactical Support Wing, Public Information Office. S/Sgt Sandy Colton. 6 USAFHRA. History of the 67th Fighter-Bomber Squadron, September 1950. 8 USAFHRA. 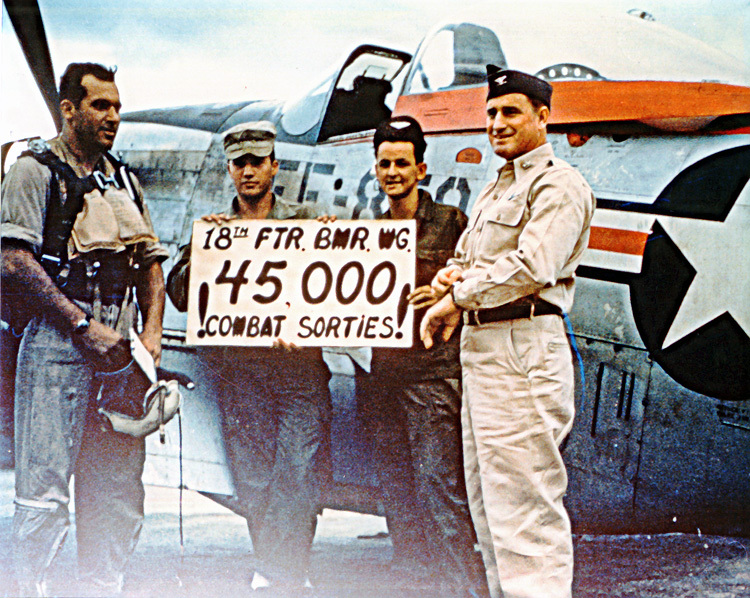 History of the 67th Fighter-Bomber Squadron, October 1950. 9 U.S. Air Force Historical Research Agency. January 2002. The U.S. Air Force’s First War: Korea 1950-1953 Significant Events. September 1950. 10 History of the 18th Fighter-Bomber Group, July-October, 1950. USAFHRA. 11 U.S. Air Force Historical Research Agency. January 2002. The U.S. Air Force’s First War: Korea 1950-1953 Significant Events. September 1950. 12 USAFHRA. History of the 67th Fighter-Bomber Squadron, September 1950. Captain Elliot Dean Ayer, USAF, was a decorated fighter pilot of WWII and the Korean War. A Pearl Harbor Veteran as a 17-year old gunner, he earned his AAF wings, personal decorations and a Captaincy by the end of the war. Rather than leave the rapidly demobilizing Air Force, he served as a Master Sergeant, until the Air Force restored his commission in 1952 to let him fly Mustangs in combat—again. The 18th FB Wing selected him to fly its 45,000th combat sortie, and he led the most heroic, yet ultimately tragic, helicopter air rescue mission of the Korean War. His bravery and leadership in two of our major air conflicts is worth remembering as the price of Freedom on this the anniversary of his death 63 years ago today. 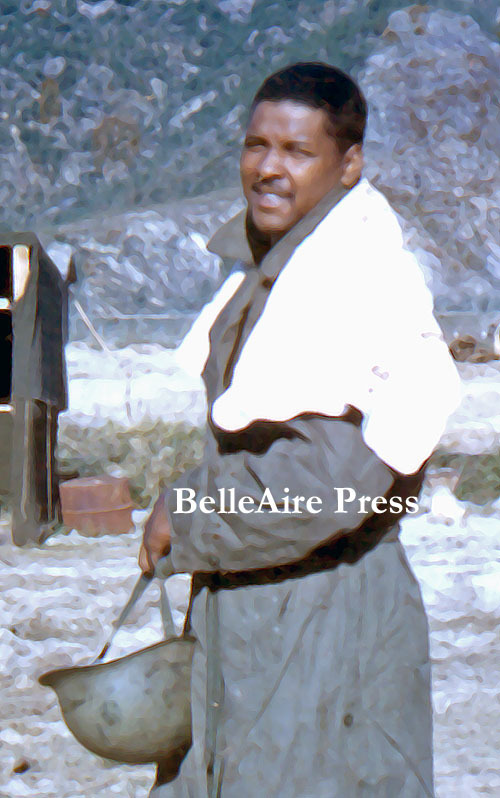 Ayer was the last 18th FBW Mustang pilot KIA in the Korean War. It was nearly dark at 1915 hours on 25 July 1952, when Captain Elliot Dean Ayer, Flight Leader of Filter How Flight was “wheels up” from K-46, Hoengsong, SK, on a twilight reconnaissance of a North Korean MSR. It was rapidly getting dark, making it harder for ground observers to make out the “655” side number or the “Lovely Lady” on the left cowling or “Lady Louise” on the right cowling. His four-ship flight included 1st Lt. William McShane flying Number Two, 1st Lt. C. J. Gossett was Number Three, and 1st Lt. Rexford R. Baldwin was Number Four. 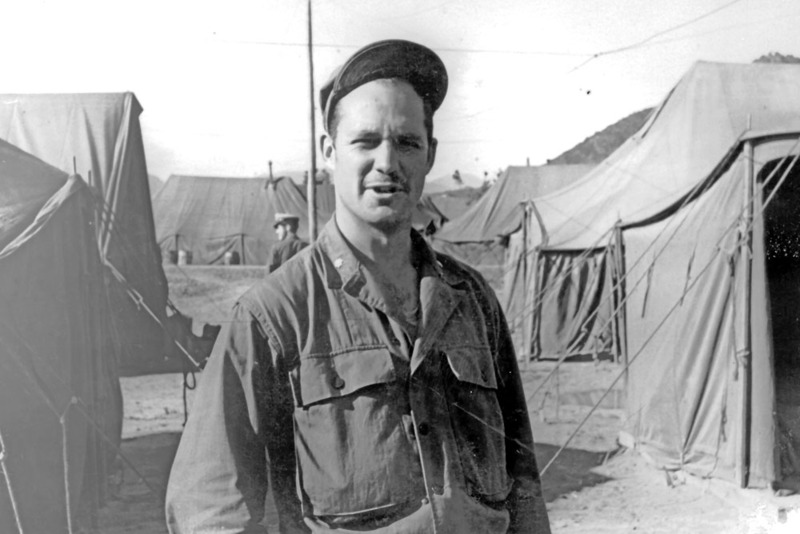 Ayer was one of the Korean War’s most experienced pilots and leaders, having served with distinction as a soldier, NCO and combat pilot during WWII. He was highly experienced in the F-51 Mustang, having earned several decorations for his bravery during heavy air combat in the Italian theater in WWII. 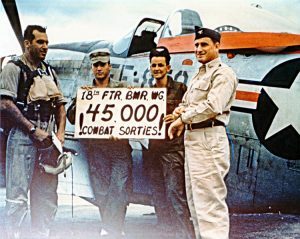 Following his appointment as How Flight Leader of the 67th Fighter-Bomber Squadron on 1 June just a few weeks before, he had been selected by the 18th FB Wing to fly its historic 45,000th combat mission, a great personal honor. Further, he had been recommended for another Distinguished Flying Cross for his leadership in directing Mission 1890 on June 25th, a harrowing helicopter extrication of a Navy Corsair pilot from off the side of a mountain west of Wonsan under heavy fire. The mission involved six Mustangs and one H-5 Dragonfly helicopter. Tragically, although the rescue mission was initially successful, the waiting Chinese used Ens. Ron Eaton as bait, and shot the helicopter down five miles from the site. 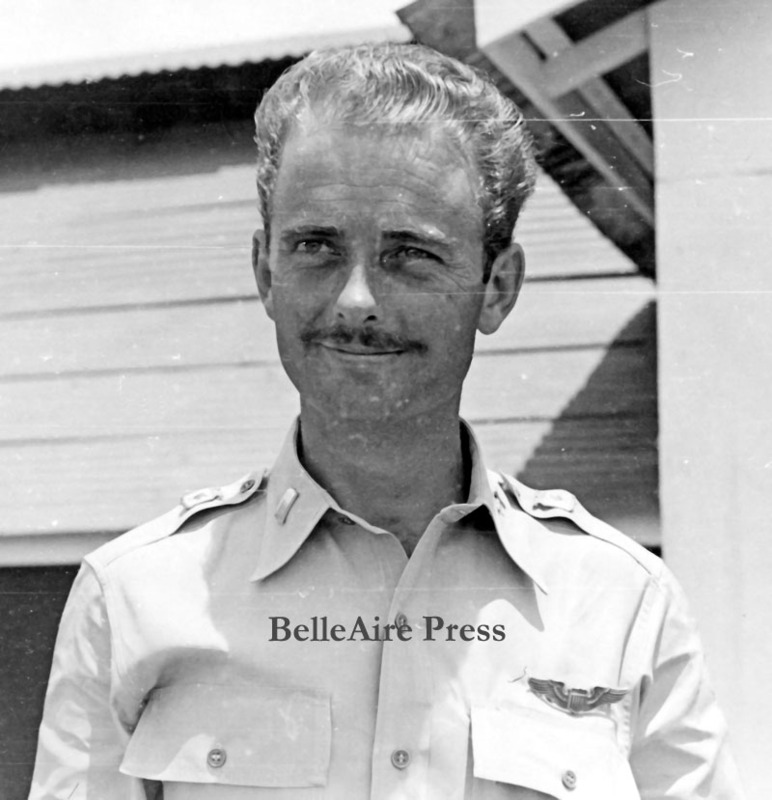 Minutes later, Ayer’s wingman, 1st Lt. Archie Connors, was also shot down while making a “low, fast pass” over the helicopter crash site to ascertain the fate of its crew and passenger. Mission 1890 became the most deadly helicopter rescue of the Korean War. Tonight was to be just another twilight MSR interdiction. But for Captain Ayer, it was the last mission, the one from which he never returned. He became the last 18th FB Wing Mustang pilot killed in combat before it transitioned into the F-86 Sabre-jet in February 1953.